All you have to do is follow Sir Patrick Stewart's Twitter to see he's always ready for some fun. 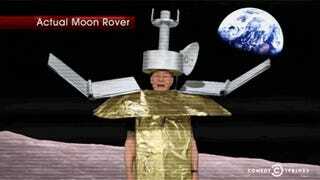 So it's only slightly shocking to see him dressed as China's latest moon rover, which was also the topic of last night's Daily Show. Watch Patrick Stewart's segment below, or head over to The Daily Show to check out the entire clip.